Do Contract Post Office facilities have magical gun free zones? I almost went postal today. But it was a contract deal, so I’m not sure. You see, I stopped by an ACE Hardware store near my home. ACE is the place. Ours sells everything from designer spackle to multi-color Post-It Notes to Reese’s Peanut Butter Cups. I know this because the Reese’s are right in the checkout line display, where I will be sure to buy some every time I visit. This particular ACE Hardware store has a United States Post Office CONTRACT facility in it. Right between shelves of office supplies and advent calendars, there is a large grey floor mat where you stand in line to mail packages, buy stamps, and tell the clerk you are not shipping anything fragile, explosive, or perishable. While I did notice the floor mat, I was not able to detect a gun free zone force field. Didn’t even feel any electrostatic buzz in the area. Nor did I get brain cancer while I was there, as far as I know. So really I’m only guessing that the floor mat designates a gun free area of the store. So here’s the problem. If you carry a concealed firearm, you do not, under any circumstance, take it into an official, designated United States Post Office. You do not have it in your car in the parking lot of a United States Post Office. You do not wear a “Body Piercing by Smith & Wesson” t-shirt. You do not even think about next weekends gun show. Right, wrong, indifferent, or completely insane, every armed citizen should know this. Yeah, I think it’s nuts too, so write your congress critters like I do. But this isn’t a United States Post Office. It’s an ACE Hardware store that sells Buck Knives, Carhartt Union Suits, and nifty deep fryers for turkeys (or road kill if you’re on a tight budget.) These things are all clearly consistent with gun totin’ right? On the other hand, there are stacks of Flat Rate shipping boxes scattered all over that one aisle between the stapler refills and front porch flags. Clearly Post Office type stuff. Are certain areas of my ACE Hardware Store federal gun free zones? If someone wants to commit armed robbery this particular ACE Hardware, do they get more prison time if they step on the grey floor mat area? What if, in process of committing the armed robbery, they knock over a stack of flat rate shipping boxes? Is that now first degree littering? Will Snookie have a boy or a girl? In either case, will the child come out of the womb spray tanned? Were federal stimulus dollars used to buy up the square footage under that particular floor mat, thereby making part of ACE Hardware federal property? If someone just wants to rob the Buck Knife display, and steps around the contract post office area, is that OK? Or do they have to leave their gun in the car? Can legislators exercise any less common sense while legislating common sense legislation? If a legally armed citizen is out shopping, on a tight time schedule, and has to buy a PVC to garden hose fitting and mail a Publishers Clearing House sweepstakes entry, do they have to make two separate trips? ACE is the place where you can legally carry a gun in this state, but is the contract post office also the place? What say you? Is it legal? Will you end up in Club Gitmo if you carry into this particular ACE? I can’t find a quick link but the regulations refer specifically to “Post Office property”, not “places that provide postal functions.” A physical Post Office and the lot it is on owned or leased by the Feds, to include parking lots on that piece of property, are Postal Property and carry is forbidden. Privately owned locations that provide postal services are -not- Post Office property and carry in them is controlled by state law. That includes contract locations like Post Office, Etc and the like. The quick and dirty way to tell is to check if the person working there is a USPS employee. If not, it is not Post Office property and Postal regulations do not apply. 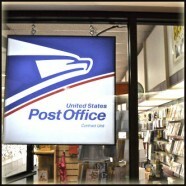 When the Post Office leases space in a mall or such, the confines of their leased space is Postal Property and carry is forbidden, but the prohibition does -not- extend to the common areas of the mall, to include common parking facilities. You can walk on by the front of their storefront open carrying and not be breaking Federal law (state law applies of course). The other way to tell is that Post Offices are required to post the controlling US Code in their facilities. No 2×3 poster saying “Firearms prohibited by such and such” means that it isn’t Postal Property. The local grocery tried that here. I printed the whole regulation as hard copy and PDF. I sent one, highlighted, to headquarters and stopped by to chat with the General Manager to show him where it also says that searches of persons and bags are legal and Little Old Ladies are not going to like being told they’re subject to search any more than I like the no carry provision. It lasted about a month.